As someone who was born to organize, I get more than a little excited over storage solutions. One of my favorite ways to corral clutter is with baskets. Wicker baskets, metal baskets, fabric baskets. I can always find something to put inside. 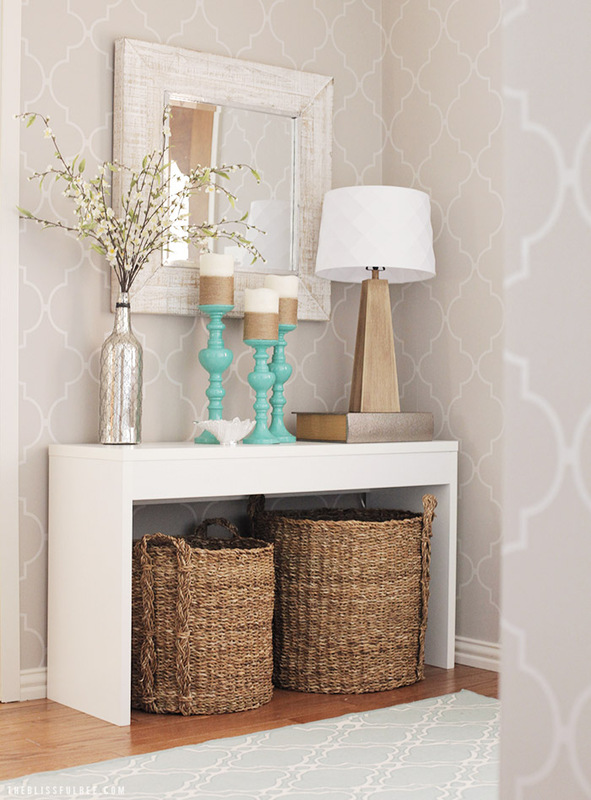 Here are 20 ingenious ways to organize with baskets. 1. 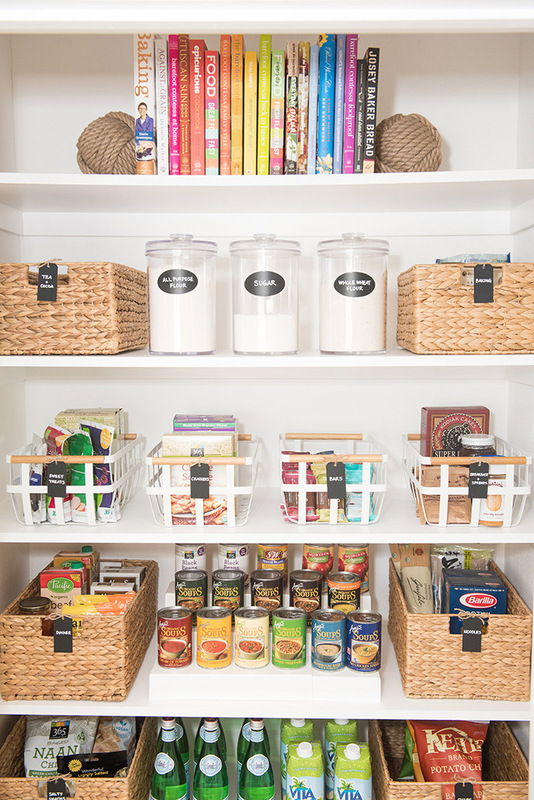 Baskets are the perfect tool to organize your pantry. 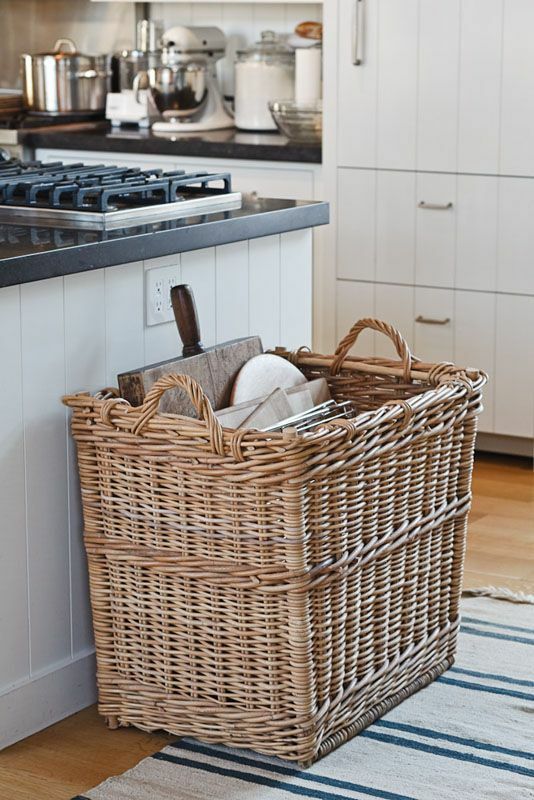 You can use larger wicker baskets to organize cookbooks, cereal boxes, bags of chips, and even small appliances. Smaller baskets work well for tea bags, seasonings, snack bars, etc. Once you’ve categorized your pantry staples, you can attach a cute chalkboard label to the outside to help you remember what’s inside each basket. 2. You can organize your kitchen counters by grouping similar items together and placing them inside a round basket like this one. 3. 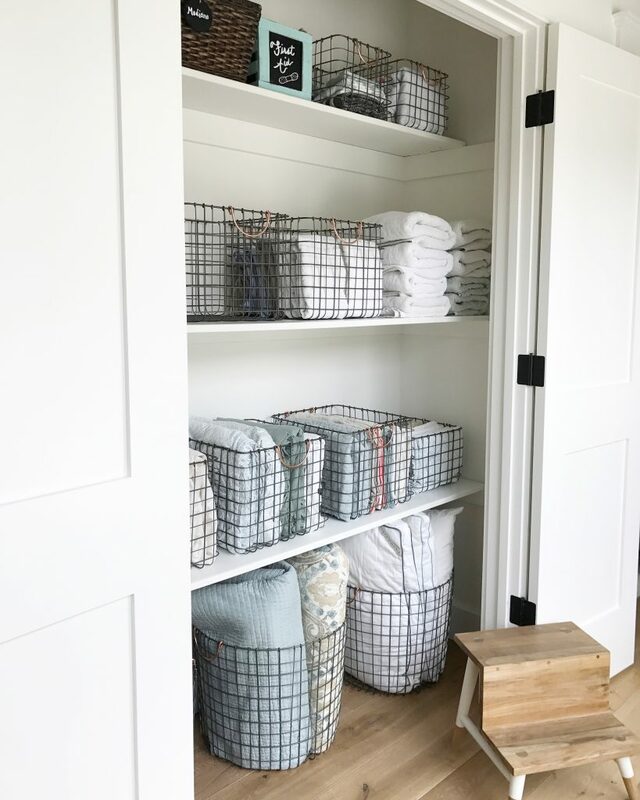 I am in love with this well-organized linen closet. 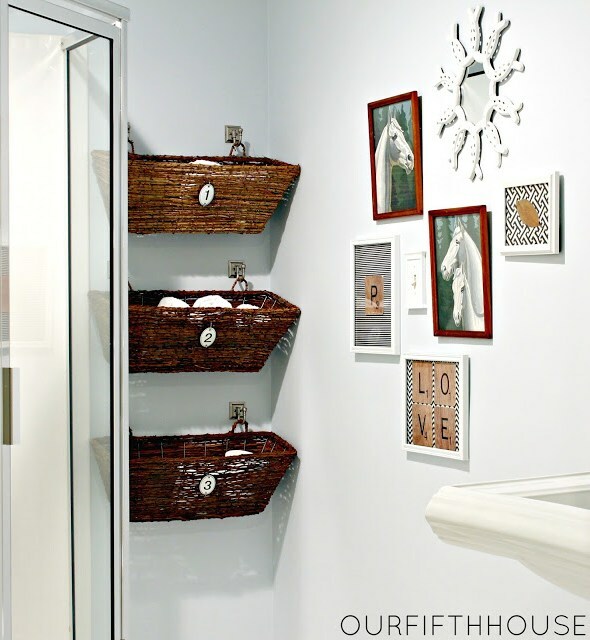 Here, the designer uses multiple types of storage baskets; woven, wire, as well as canvas. She ties them all together with neutral colored towels and bedding. If you look closely, you can see the added touch of artful wallpaper behind each shelf. 4. 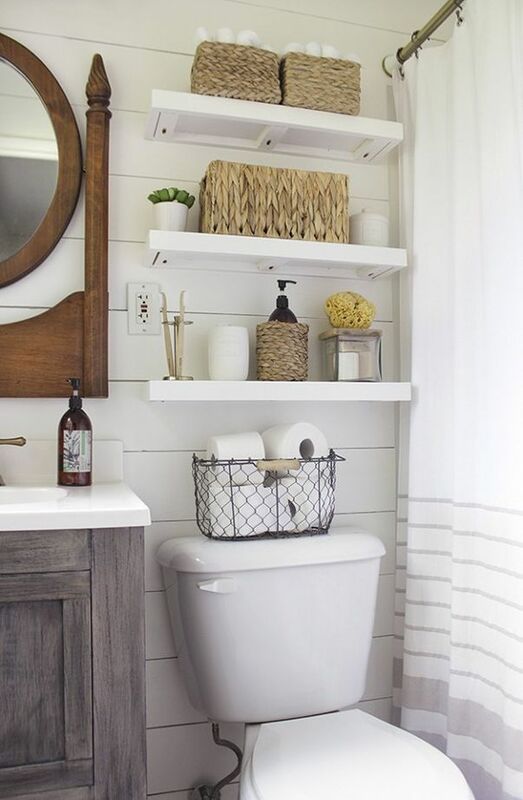 You can also use smaller baskets on narrow shelves to greatly increase the storage space in a small bathroom. Note the wire basket on the lid of the toilet filled with toilet paper. Pretty and functional! 5. 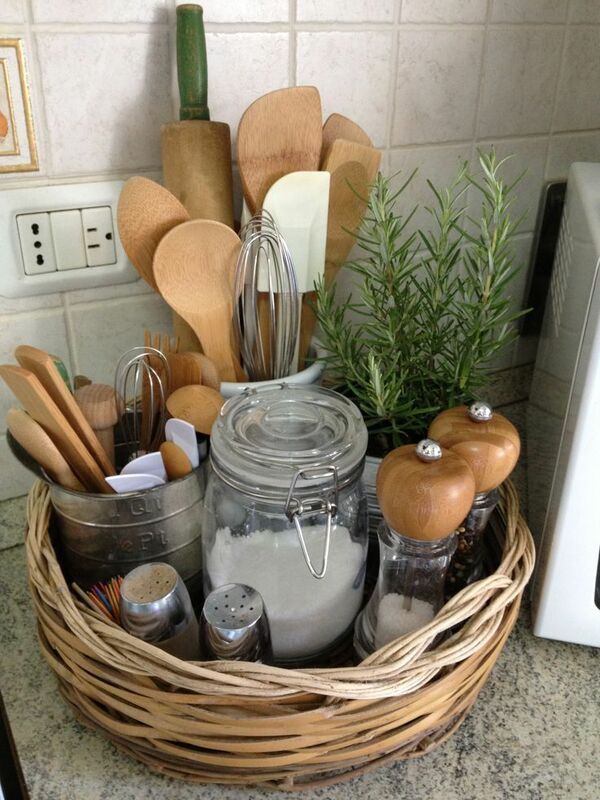 This idea to use a large basket to store cumbersome pans, racks, and cutting boards is absolutely genius! Who Knew There Were So Many Ways To Organize With Baskets? 6. 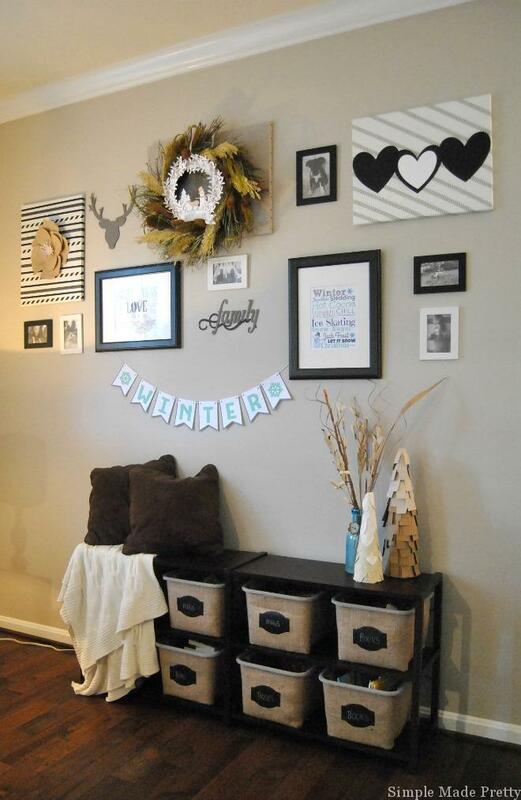 You can easily create cubbies in an entryway and fit them with baskets. You can then fill the baskets with shoes, keys, library books, hats, gloves, and more. 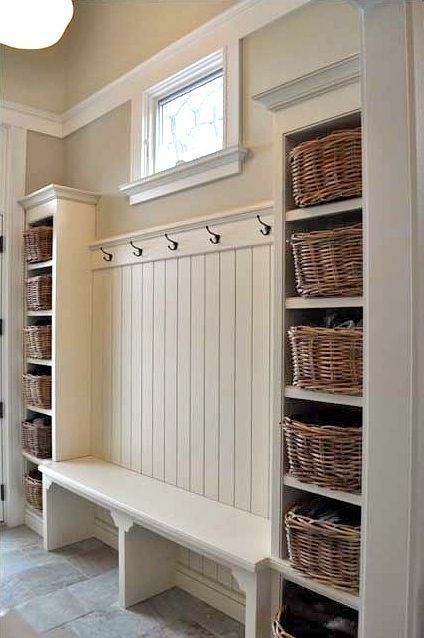 A simple solution to entryway clutter. 7. I love, love, LOVE the idea of hanging baskets on the walls! This way, you can keep things off of the floor, and out of reach of children and pets. 8. 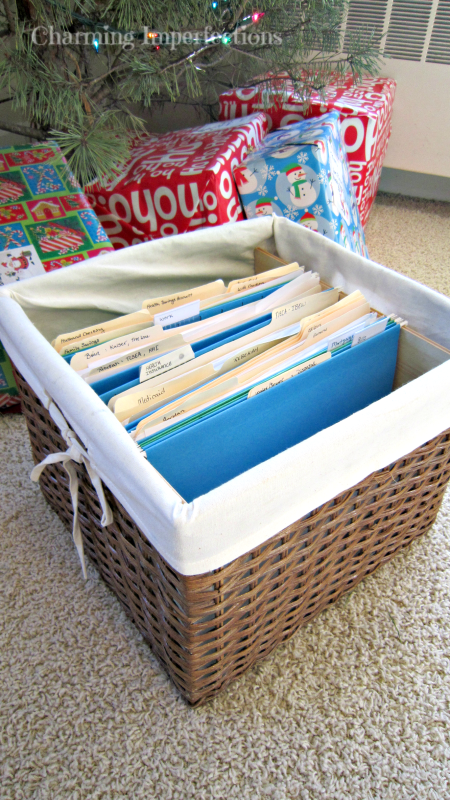 Here’s an easy and attractive way to store file folders. 9. 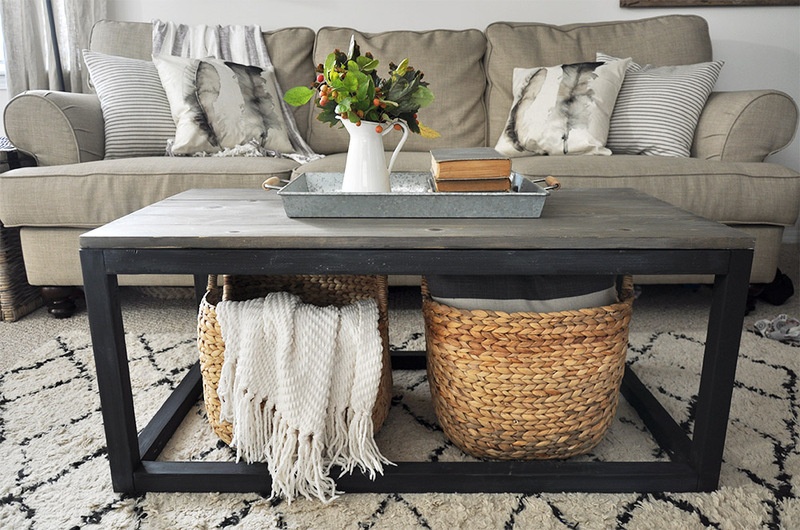 The photo below is actually for a DIY coffee table, but I adore the way she stashed the round wicker baskets underneath. She uses her baskets to store throws and pillows. However, you could also store toys (for kids and dogs), electronics, magazines, and board games. 10. 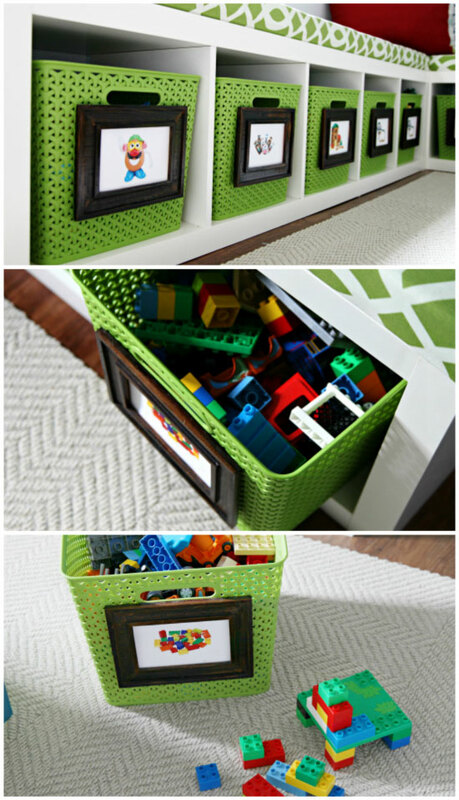 An awesome way to keep toys picked up in your child’s room. 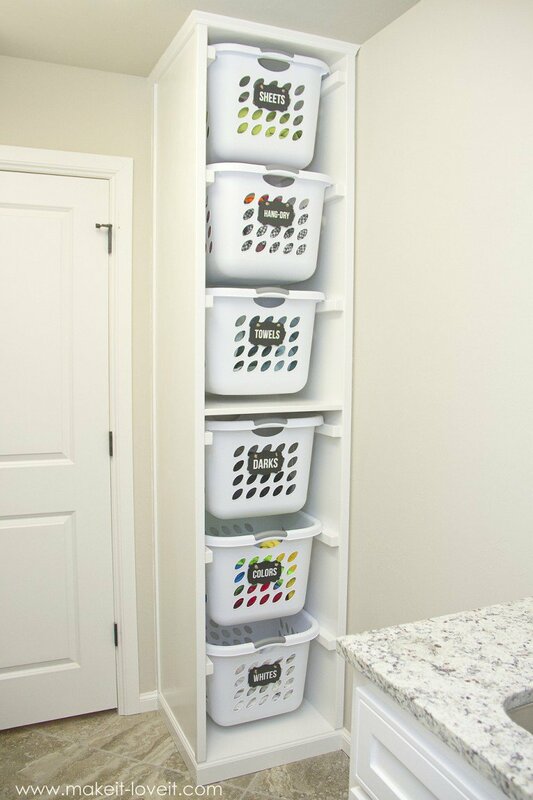 She hung the baskets low enough so that her daughter can easily clean up her own room. 11. Another clever way to store toys is to buy one of these 9-cube cubby systems and use baskets in some of the shelves. This is the method I use most in my own home. 12. I love this entryway set up by The Blissful Bee. Those baskets under the table are adorable. I love them so much, I scoured the internet to find them. You can get them HERE. 13. If you have a dog that loves toys (like mine does), you most likely find yourself tripping over them constantly! 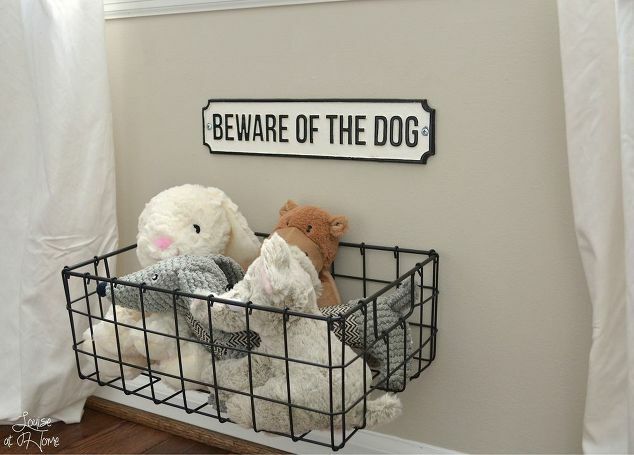 Here’s a great idea to store your dog’s toys. He can still reach them when he wants to play, and you won’t have to keep kicking them out of the way. Maybe you can even train Fido to put them away when he’s finished with them! 14. 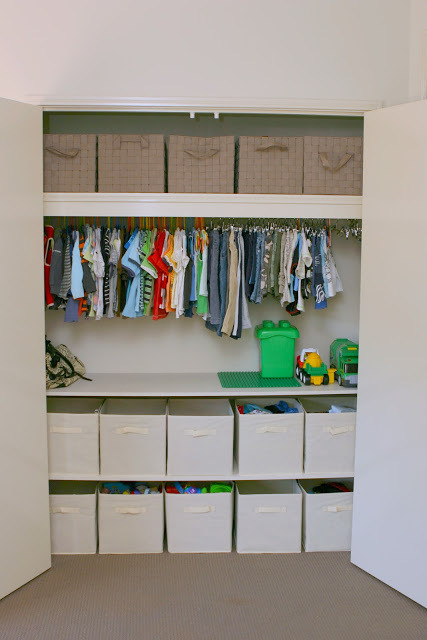 Check out this well-organized closet from Max and Me. All of her son’s clothes are stored inside the closet, so there’s no need for a dresser. Looks like she even had room to fit a few toys inside. 15. If you drool over perfectly organized playrooms, this one is a must-see. 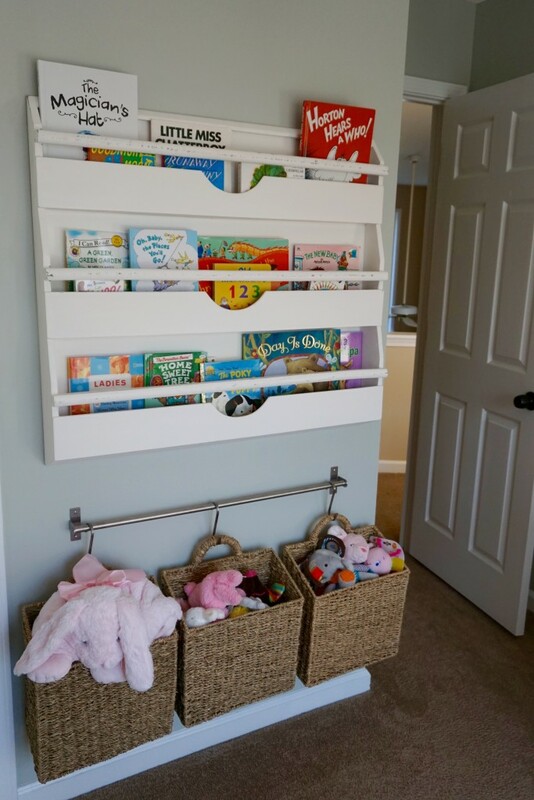 To create this functional yet attractive storage system for toys, you simply need to turn a tall, narrow bookshelf on its side, add some cushion to the top, and fill the cubbies with baskets. I love how the designer framed pictures of the contents to use as labels. 16. Why should wicker baskets have all the fun? 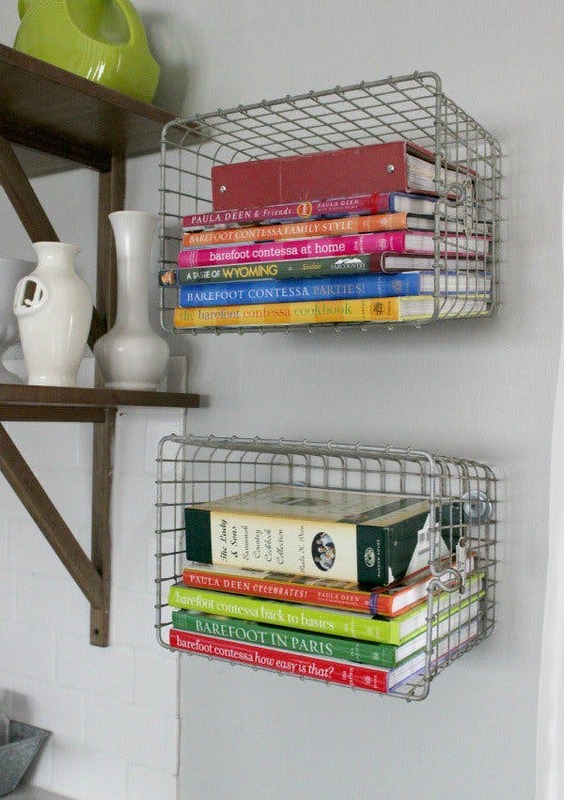 Mount wire baskets to the wall by their bottoms and use them to store books, spices, towels, and more. 17. Speaking of wire baskets. OMG! 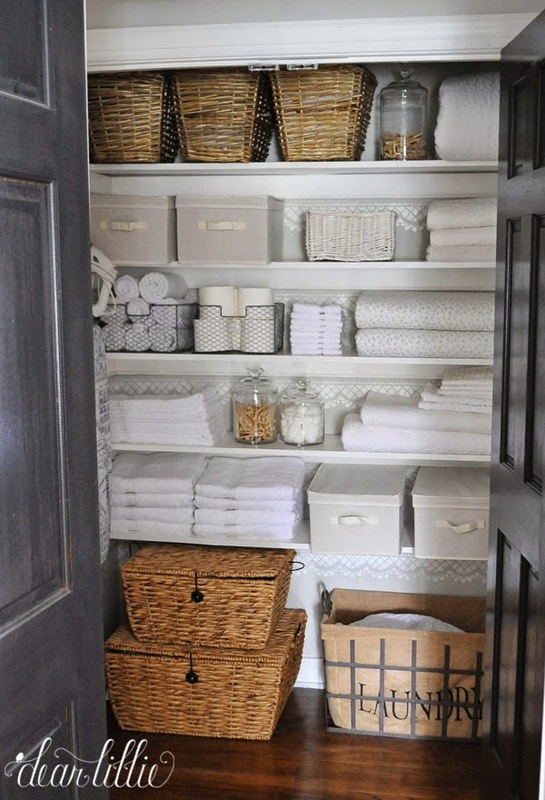 The organizer in me is so inspired by this linen closet. It’s the perfect example of sophisticated simplicity. 18. 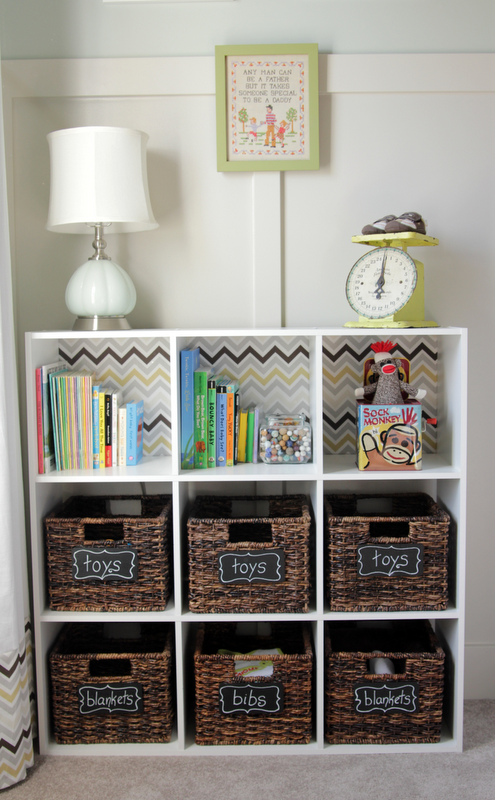 Here’s one of the most resourceful ways to organize with baskets. I’m thinking you could also duplicate this idea for a child’s bedroom. Click below for the tutorial. 19. If you live in a home with stairs, you know how difficult it can be to remember to put stuff away at the end of the day. 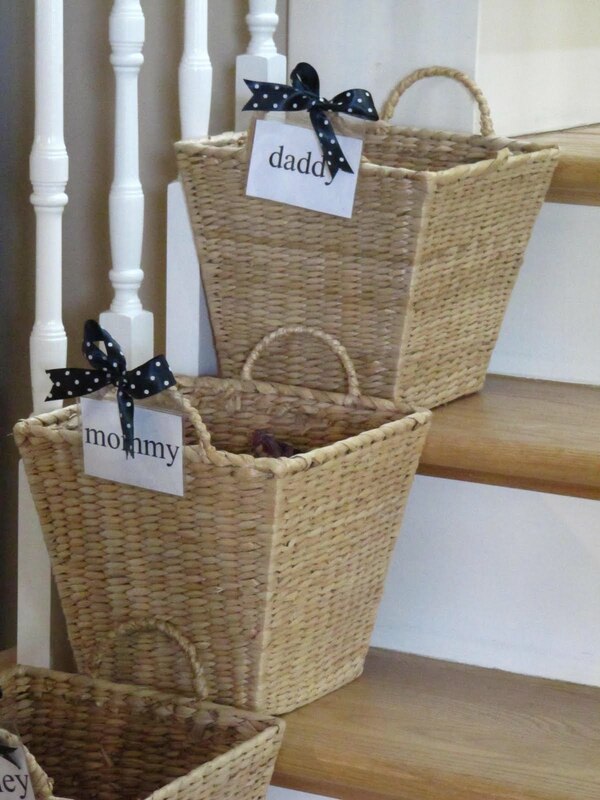 Why not give each family member a basket with his/her name on it. Drop stray items in it during the day and carry it upstairs each night. Problem solved! 20. Melanie at Simple Made Pretty has a tutorial showing how she turned ugly dollar store baskets into these cool burlap storage baskets. If you are into DIY, be sure to check it out! So, what do you think? Do you love to find ways to organize with baskets like I do?